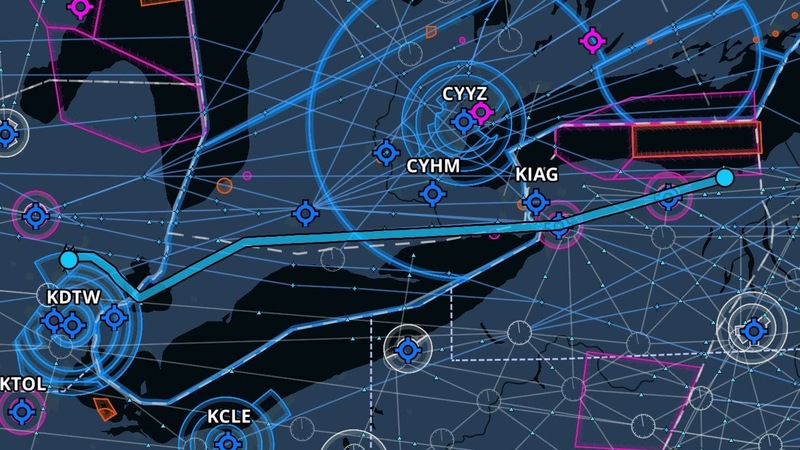 Twelve years ago on Thanksgiving Day, Kristy and I ventured through Canadian airspace for the first time to attend my family's traditional feast. Wrapped in the fickle embrace of Great Lakes climate, we took advantage of a rare bout of nice weather at November's end. In the years that followed, Mom joined us for Thanksgiving in New York with friends. Though the venue has changed over the years, we have always emphasized spending the day with people who mattered to us. This year, with Mom gone and her house sold, I experienced a strong sense of being untethered. Though I was happy to relinquish the burden that Mom's house represented, its sale broke my remaining connection with home. Fortunately, we received an intriguing invitation from Pam and Stephen to spend Thanksgiving with them in South Bend, IN. I spent less time with them in 2018 than in previous years and we quickly accepted their invitation, particularly when it became clear that the Great Lakes would allow (relatively) easy passage by air. A journey to South Bend in the Warrior would knock at least four hours off of the one-way drive. Though I had never set foot in South Bend, IN, the flight there would nonetheless prove to be a homecoming of sorts. Winter barged in with such great enthusiasm this year that it failed to wait until the trappings of autumn were removed. Snowbanks appeared at the edges of Rochester's streets that were built on foundations of leaves still awaiting city pick up. Uncertainty in weather forecasts directly affects my ability to sleep the night before a cross country flight. Forecasts for ceiling were my primary concern and they varied widely from "no problem" to "no go". With a low freezing level, there was no denying that Thanksgiving would be a good day to stay out of the clouds. Would they be high enough to allow safe passage underneath? Thanksgiving morning, a low ceiling hung over Sodus, but the sky was clear to the west and actually better than forecast. On take-off from Sodus, I heeled the Warrior's nose hard over into a northwesterly wind, tracking out with a 20° crab angle in a shallow climb to pick up airspeed before penetrating the inevitable shear layer laid across the treetops. After receiving an IFR clearance in the air, we spent just less than ten minutes in the cloud bases before escaping the cold vapor without any ice accumulation on the airframe. The departure was the most excitement we had for the entire aerial journey and was plenty for Kristy. With cold temperatures and poor heating in the backseat, the flight was one of discovery with respect to heat flow in the Warrior's cabin. After nearly fifteen years of ownership, we learned some new things about the heater in an effort to make the journey more comfortable for The Bear. The Bear's disposition improved markedly as we increased heat flow to the back seat. This was important because it was to be a long flight. I calculated a four hour flight time to South Bend. We would arrive with more than my my self-mandated hour of reserve fuel, but not by much. No matter the altitude, our flight to South Bend faced a headwind. I chose 4,000 feet for cruise to face the least amount of wind. It was the lowest IFR altitude available through the area. In making this choice, I did not account for Cleveland Center's weak transmitter in the vicinity of the Aylmer VOR (and, of course, recent deletion of Victor 2 eliminated the published Minimum Enroute Altitude [MEA] through the region). Once passed to Cleveland by Toronto Center, we lost two-way communication and, though I could hear other aircraft talking with Cleveland, I could not hear the controller. Closer to Aylmer, I was able to receive Cleveland, but the controller could not hear me. South shore of Ontario, Canada. We went through the "November Two One Four Eight One, if you are receiving Cleveland, squawk ident" routine and eventually managed quasi two-way communication via relays from a SkyWest airliner. 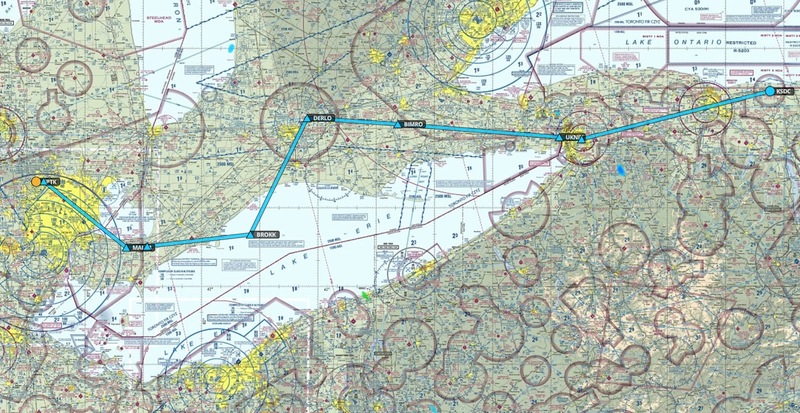 Farther west, Cleveland restored two way communication with ATC by passing us to Selfridge Approach. We flew over an industrial site in Ontario, Canada that I mentally dubbed "Little Gary". 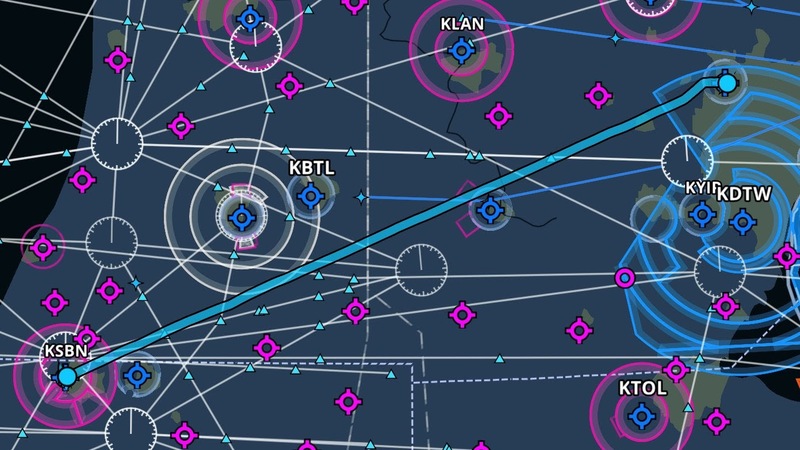 Over the years, it has become apparent that Detroit Approach is very particular about the routes taken through their Bravo airspace. The young-sounding controller offered to keep us at 4,000 feet but vector us north (experience suggested that he would send us over Oakland County International) or climb us to 6,000 feet. 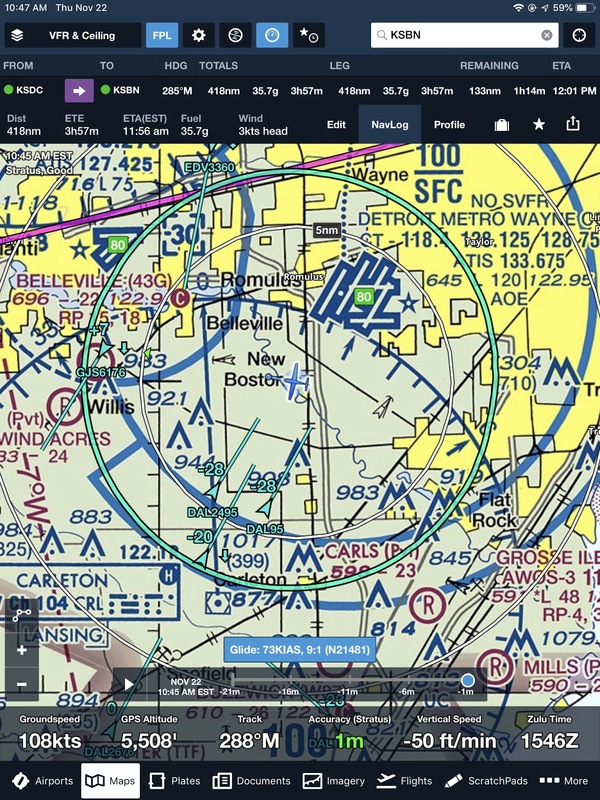 Hoping to fly on our current course directly over downtown Detroit for photos, I opted to climb with the understanding that we would lose groundspeed. The controller thanked me for the climb, then proceeded to issue vectors anyway. Consistent with previous experience, we crossed the area perpendicular to Detroit's arrival corridor. We followed Detroit's vectors while monitoring an aircraft Emergency Locater Transmitter broadcasting in the area. As usual, we will never know if the whooping on 121.5 MHz represented an actual emergency or glitch, we only know that we stopped receiving it as we flew over the top of Detroit Metro. Over Ann Arbor, Detroit cleared us direct to South Bend and offered a return to 4,000 feet. Considering that we gave up ten knots of ground speed at the higher altitude, we happily accepted. I had always heard of Michigan International Speedway (MIS to those in the know), but never knew where it was. I do now. Skimming along the base of the Mitten, we passed the Litchfield VOR where I practiced VOR tracking under the hood almost exactly 17 years earlier (November 21, 2001). It represented the farthest east that I ever flew with Bill while working on my Private Pilot certificate. We overflew Coldwater, where I landed a Piper for the first time, then over Colon (pronounced exactly as in anatomy class, unfortunately) distinctively pinched between two north/south-oriented lakes. In my memory, I could still hear an echo of Bill pointing out the convenient landmark. Three Rivers, where I learned to fly and where I first brought Warrior Four Eight One "home", was to the north. We transited my former practice area where I took note of the familiar landmarks defining its boundaries. During my time flying out of Three Rivers, Kristy was teaching in Constantine, MI where a new high school was under construction. I entertained myself by taking a series of in-process aerial photos of the construction site for the principal. I immediately recognized the structure below, now sixteen years old. Not far to the north was Dowagiac, where I not only received my first light aircraft ride in Dave's Citabria, but where I soloed. Finally, we passed north of Elkhart where I earned my Private Pilot Certificate. Though our destination was an unfamiliar one, the flight there brought me directly back to my aeronautical home turf. As we continued southwest, the haze below thickened and there was little opportunity to sight see over Notre Dame where Pam teaches. When I rolled the wheels onto South Bend International's 8,412 foot long Runway 9R, it marked our arrival at my 187th unique airport. ForeFlight-generated GPS ground track from Sodus to South Bend. We landed at noon, exactly the arrival time I forecast to Pam. I will not claim airline reliability, but I have done well with my flight planning this year. The four hours en route also marked the longest leg that Kristy and The Bear have ever flown in our airplane. Free hot chocolate? Yes, please! We parked at Corporate Wings, where the fuel was somewhat pricey for the region but very reasonable by Upstate New York standards (it was less expensive than our fuel at Sodus). The staff was friendly and promised to plug-in Warrior Four Eight One's Reiff pre-heater early the next morning for departure. While I unloaded the airplane, The Bear took advantage of the complimentary hot chocolate / coffee machine to make hot chocolates for us both. Corporate Wings is a terrific FBO. We were happy to be reunited with Pam, Stephen, and The Crushinator (Crush for short) in South Bend. Because of various dietary preferences and restrictions, we did not have a traditional Thanksgiving dinner anchored by turkey with the usual supporting players. Instead, Pam prepared a cider-glazed salmon with roasted vegetables, some wonderful mashed sweet potatoes that we completely forgot to eat, and a creamy pasta accented with lemon zest. It was nontraditional, but yummy. Some traditions are important to maintain, however. In my family, the traditional Thanksgiving dessert is Chocolate Lush, an addictive concoction of sweetened and whipped cream cheese, chocolate pudding, and Cool Whip layered on a foundation of walnut-infused crust. For decades, Mom was the center of attention at dessert time on Thanksgiving with this simple, but delicious confection. This year, The Bear took on Mom's critical role as the maker of everyone's favorite dessert. ...and The Bear finished the job solo with all fingers intact (an impressive feat given the company). Fortunately, the sharp knife went away before the inevitable wackiness began. Thanksgiving just isn't Thanksgiving without someone making the Chocolate Lush. The Bear did a wonderful job of it, having assisted Mom with its preparation many times over the last few years. Mom would have been proud of her. Once dessert was completed, it was time to lavish attention on Crush. Life as a wiener dog must be grand. After a short, but excellent visit with Pam and Stephen, we prepared to depart South Bend the next morning. Rain was expected to move-in from the west and I wanted to be back in Sodus before full nightfall. When I looked outside, I noticed that the parked cars had frost on them and I wondered about the condition of the Warrior's wings. True to their word, line service at Corporate Wings plugged-in Warrior Four Eight One early that morning and the engine was reasonably warm when we arrived. The wings, however, were contaminated with frost. When I swept a glove across them, the frozen stuff was on the edge of melting and wiped away immediately. I promptly "deiced" the remaining wing surfaces with the now sodden glove. 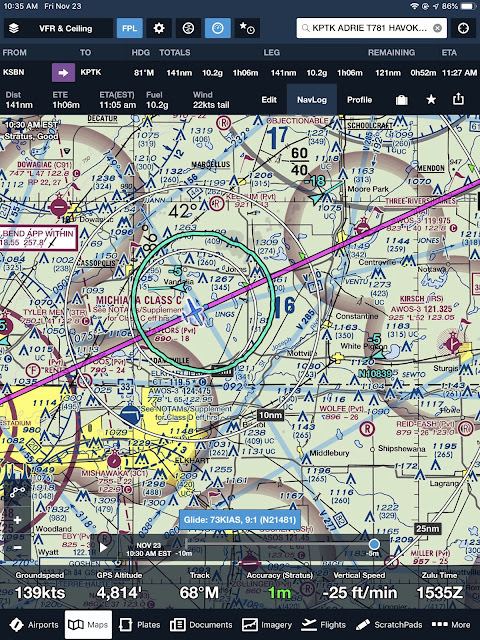 ForeFlight showing Elkhart (where I passed my check ride), Dowagiac (where I soloed), and Three Rivers (where I learned to fly). We departed behind a regional jet ("caution, wake turbulence") and passed back through the cradle of my aeronautical education en route to Oakland County International. We were to meet our friend Ann for lunch in my hometown. I have known Ann since seventh grade and we went to college together, where Ann was a part of the same group of friends that included Kristy. We last saw Ann in 2015, which was far too long an interval between visits. Though she lives in New Hampshire, she was back in our hometown for Thanksgiving. "Look Little Bear! There's the Three Rivers Airport where I learned to fly!" I received a bored yawn in response, so I basked alone in the nostalgia of the familiar runway layout. Peering northward toward Kalamazoo, I added to Kristy, "I hope that Ann knows how she rates - we're passing Kalamazoo without even stopping!" GPS track from South Bend to Oakland County International with a little wiggle south of Kalamazoo where I swung slightly south to photograph the Three Rivers Airport. We landed at Oakland County with a significant crosswind. "Straight to the end, right on Charlie 1, Ground point niner," instructed Pontiac Tower with a bored "you know the drill" tone of voice. At Michigan Aviation, Scott explained that the owner recently passed away. I asked if their jobs were secure. Scott reassured me that the son was taking over, had already solicited suggestions for improvements from tenants and staff, and was beginning renovations to update the lobby and repair the leaky roof. This seemed like a good thing for the FBO. Scott indicated that it would probably look very different the next time we came through. Quietly, I wondered when that would be. After a summer and fall of flights to Oakland County International, I did not foresee any more in the future. Minutes later, we arrived at Parker's Hilltop Brewery in one of Michigan's courtesy cars just in time to catch Ann arriving for lunch. The Hilltop makes exquisite fish and chips. Too many places overcook the fish, but Hilltop's is always prepared to flaky, but moist, perfection. Not to be outdone by the main course, the chips are particularly good. The Bear did an amazing job of demolishing her slab o' fish, though she had some help from Kristy. As long as I have known her, conversations with Ann have simply flowed and, before we knew it, two hours passed. Ann had family commitments and a speaking engagement later that evening and we were in a race with the immutable sun. We said our goodbyes, topped off the fuel in the courtesy car, and returned to the waiting Warrior. HHOWE Is That a Good Idea? To my dismay, we received a HHOWE1 departure routing that included a superfluous detour over London, Ontario. However, between changes made by Detroit Approach, Selfridge Approach, and Toronto Center, we followed a nearly direct course home with the exception of a minor excursion over Lake St Clair. In three instances of receiving this clearance, ATC has consistently made unsolicited alterations to shorten the path home for me. I genuinely appreciate it when the ATC-issued routes are crummy enough that ATC proactively intervenes to improve them. On runway heading off of Oakland County, we passed over the Palace of Auburn Hills, the defunct arena that was once home to the Detroit Pistons. It opened when I was in high school and was one of the better regional arenas for concerts. I remembered seeing Def Leppard, REM, The Cure, and Rush (three times, including the final R40 tour) there. With the recent trend of siting entertainment and sports venues in downtown Detroit, I suspect that demolition is the most likely fate for the Palace, continuing a pattern of major institutions that I saw built as a child succumbing to obsolescence and destruction. Detroit vectored us out of the area and across Lake St Clair. We never actually flew any portion of the HHOWE1 departure procedure. From 7,000 feet and a few miles away, we watched an enormous freighter negotiate the channel leading northward out of Lake St Clair. Flying across Canada, I listened to music while Kristy and The Bear fought several bold battles against the Clawborg 3000. This was an activity that obviously required deep concentration. We landed at the Williamson Sodus Airport in an ugly, gusty, crosswind about 35 minutes after sunset, more or less according to plan. Strictly speaking from a poultry perspective, it was not a traditional Thanksgiving. However, this year's holiday was traditional for us because it involved our airplane connecting us to people who matter. And, of course, Chocolate Lush. There can be no Thanksgiving without Chocolate Lush. Absolutely! I hope you had a wonderful Thanksgiving.